According to a new report by Juwai.com, Chinese-Americans outspent offshore (mainland Chinese) buyers of US real estate by nearly 5 to 1 in 2014. Chinese-Americans invested $105.5 billion in US real estate, compared to the $22 billion invested by Mainland Chinese. Because 61% of Chinese Americans do not speak English with fluency, and three quarters are foreign-born, they tend to use the same media and information channels to research and purchase property as overseas Chinese-speaking buyers. 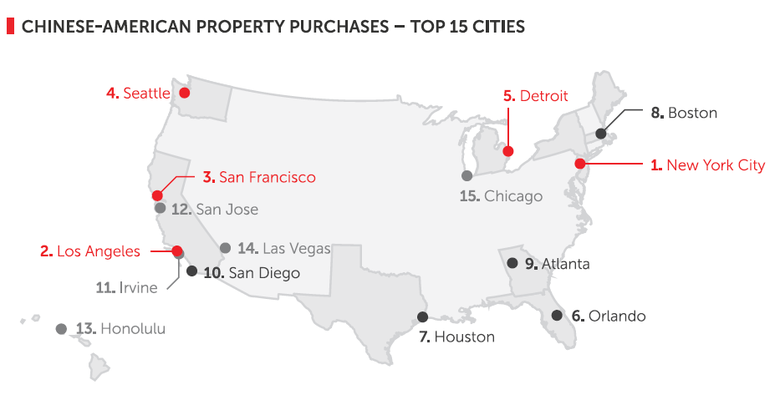 For Chinese-American real estate purchasing, the top states are California, New York, Florida, Washington and Texas. Internationally, Chinese Americans spend the most on real estate in Belize (US$6.5 million) and New Zealand (US$2.2 million), followed by Cyprus, Italy and the United Kingdom. More US billionaires are Chinese American than of any other Asian-American ethnicity. Chinese American adults are more likely to be married, and more likely to prioritize a successful marriage and being a good parent, than the general public. This entry was posted on Wednesday, August 26th, 2015 at 11:37 PM and is filed under Business/Economy, Culture, ISSUES.